The American Gelbvieh Association elected directors and officers for 2018 during its national convention in Wichita, Kansas. Front row (left to right): Dan McCarty, Rifle, Colo.; Secretary Klint Sickler, Gladstone, N.D.; Executive Director Myron Edelman, Broomfield, Colo.; President Scott Starr, Stapleton, Neb. ; Vice President John Carrel, Columbus, Mont. ; Treasurer Walter Teeter, Mount Ulla, N.C.; Lowell Rogers, Seminary, Miss. Back row (left to right): Leland Clark, Barnard, Kan.; Randy Sienknecht, Gladbrook, Iowa; Doug Hughes, Max Meadows, Va.; Jeff Swanson, Oxford, Neb. 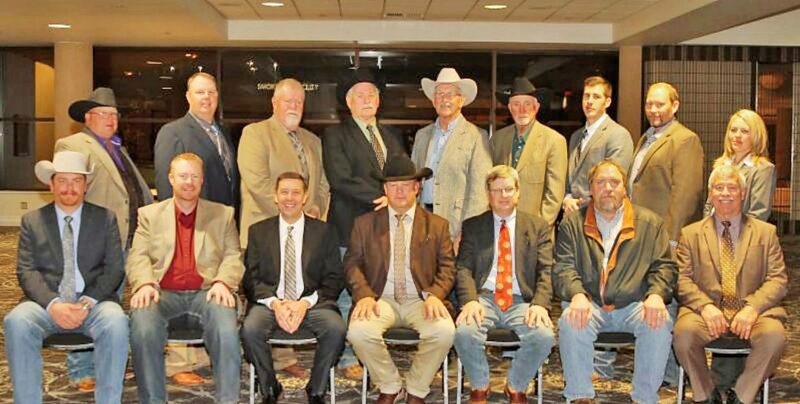 ; Dennis Gustin, Mandan, N.D.; Jeff Loveless, Spanish Fork, Utah; Dustin Aherin, Phillipsburg, Kan.; Derek Martin, Bucklin, Kan.; Andrea Murray, Kingfisher, Okla.
Members of the American Gelbvieh Association elected five candidates to the board of directors at the annual membership meeting held Dec. 9, 2017, during the 47th Annual American Gelbvieh Association National Convention in Wichita, Kan. Newly elected board members are Dustin Aherin, Phillipsburg, Kan.; Jeff Loveless, Spanish Fork, Utah; Derek Martin, Bucklin, Kan.; and Dan McCarty, Rifle, Colo. Re-elected to serve a second term was Lowell Rogers, Seminary, Miss. The AGA board of directors also elected individuals to serve in leadership positions on the executive committee for 2018. Scott Starr, Stapleton, Neb., was re-elected as AGA president. Elected as vice president was John Carrel, Columbus, Mont. Klint Sickler, Gladstone, N.D., was elected as secretary and Walter Teeter, Mount Ulla, N.C., was re-elected as treasurer. Other members of the AGA Board of Directors are: Leland Clark, Barnard, Kan.; Dennis Gustin, Mandan, N.D.; Doug Hughes, Max Meadows, Va.; Andrea Murray, Kingfisher, Okla.; Randy Sienknecht, Gladbrook, Iowa; and Jeff Swanson, Oxford, Neb. Retiring members of the 2017 AGA Board of Directors were Andy LeDoux, Ree Heights, S.D. ; Neal Pearson, Lake City, S.D. ; Dustin Rippe, Belleville, Kan.; and Duane Strider, Asheboro, N.C. The AGA would like to thank these members for their years of service on the AGA board of directors.